This book provides a roadmap to the best Internet places from which to sell, promote, get reviewed, and find new customers. 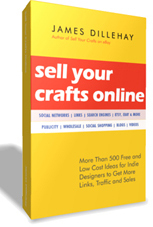 This new guide reveals more than 500 Internet promotion ideas for those who make and sell handmade crafts. Get this book today! Successfully selling your crafts at local shows and fairs might be as far as you want to take your business. Taking the next step means selling your crafts in gift shops boutiques and galleries and takes a very different approach. When selling your handmade crafts through consignment shops or outright to stores, the direct approach is often the fastest way to get your work into shops or galleries. In many cities, I have had good results simply walking into a store and introducing myself to the owner or manager. Never walk in with your pieces - unless you are wearing something - because it doesn't show respect for the store manager and comes across as unprofessional. Unless you have a specific appointment, avoid approaching stores on a Monday, Friday, or weekend. The best times are mornings in the middle of the week. Store owners are too busy or too tired in the afternoon, and they are often gone on weekends. The bigger the shop, the more likely they will want to make an appointment for another day. Stay flexible enough to work with their time frame. Never attempt to push your schedule on them. You may not have to look far to find wholesale accounts. It’s inevitable that you will be approached by store owners at craft shows looking for new merchandise. After an owner or buyer approaches you at an event, follow up by giving them a phone call to say thanks for stopping at your booth. Make an appointment to meet with the owner and give a presentation. A good store account can provide steady sales for a long time. After establishing wholesale accounts, keep in touch with them. Sales will increase when you make more personal visits or telephone calls with the owners. Make recordkeeping a breeze with Outright.com! Income and expenses are automatically gathered from online banking, credit cards, PayPal, and more. Transactions are categorized for easy to understand financial charts and reports, and everything is organized for tax time. Try Outright.com Online Bookkeeping - Free Trial.